The meetings between Taiwanese President Tsai Ing-wen and senior Republicans in Dallas, Texas last Sunday will only heighten tensions between the United States and China ahead of Donald Trump’s inauguration as US president next week. Tsai met with Senator Ted Cruz and Texas Governor Greg Abbott during a stop-over on the way to visit several Central American countries. Yesterday, to underline Beijing’s concerns about closer US ties with Taiwan, the Chinese navy sailed its aircraft carrier, the Liaoning, through the Taiwan Strait. The Taiwanese military scrambled F-16 jet fighters and dispatched a frigate to “surveil and control” the passage of the Chinese warships. Trump has already destabilised relations with China by declaring last month he would not “be bound by a One China policy unless we make a deal with China having to do with other things.” Under the One China policy, formally adopted in 1979, the US recognised Beijing as the sole legitimate government of all China, including Taiwan, and ended diplomatic relations with Taipei. Trump’s threat to overturn the One China policy was accompanied by denunciations of China over trade, its failure to rein in North Korea and its land reclamation activities in the South China Sea. Just days earlier, Trump upended decades of diplomatic protocol by taking a phone call from the Taiwanese president—the first direct contact between US and Taiwanese leaders since 1979. Likening China’s island building as “akin to Russia’s taking Crimea,” Tillerson accused the Obama administration of an inadequate response. His remarks set the stage for a direct military confrontation between China and the United States, two nuclear-armed powers. Any attempt by the US to block Chinese aircraft and ships from accessing the islets it controls in the South China Sea would lead to a clash that could rapidly escalate into war. After his meeting with Taiwanese President Tsai on Sunday, Senator Cruz also took a provocative stance toward China. 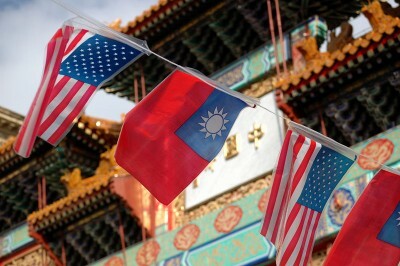 Beijing is particularly sensitive to any hint that the US is treating Taiwan, which it regards as a renegade province, as a sovereign nation, and has warned that it will take military action to prevent any formal declaration of Taiwanese independence. Cruz’s strident tone reflects a broader anti-China stance taken by the Republican Party in its 2016 platform, which bluntly declared: “China’s behaviour has negated the optimistic language of our last platform concerning future relations with China.” It contained blistering denunciations of China over human rights, its “preposterous claim to the entire South China Sea” and island building, its currency manipulation and mockery of copyright “in an economy based on piracy.” The document also reaffirmed “strong support” for Taiwan, including through greater trade, arms sales and backing Taiwan’s participation in international organisations. Trump’s incoming administration contains officials, such as Commerce Secretary Wilbur Ross, who are committed to trade war measures against Beijing, including branding China as a currency manipulator and imposing huge tariffs, of up to 45 percent, on Chinese goods. Among the officials are also figures with strong ties to Taiwan, such as Trump’s Chief of Staff Reince Priebus, who met with Tsai in 2015 before she became Taiwanese president last year. A spokesman for the Taiwan Affairs Office in Beijing, Ma Xiaoguang, did not draw a direct connection to Tsai’s discussions and the passage of the Liaoning through the Taiwan Strait, saying only that it was part of scheduled training. However, he did warn that the Taiwan-China relationship would face “increasing uncertainty, looming risks and challenges” in the coming year. China’s flexing of military muscle, which included a flight by an H-6 strategic bomber into the South China Sea last weekend, plays directly into Washington’s hands and only heightens the danger of conflict. The Chinese Communist Party regime, which represents the tiny layer of super-rich oligarchs who have enriched themselves through the processes of capitalist restoration since 1978, is organically incapable of making any appeal to the international working class—the only social force that can halt the US drive to war. Tsai is due to transit the United States again over the weekend after visiting Honduras, Nicaragua, Guatemala and El Salvador—four of the 21 small, impoverished countries globally that maintain diplomatic relations with Taiwan rather than China. She is desperate to shore up these ties as Beijing ramps up its own diplomatic offensive to encourage these countries to break with Taiwan. Last month, the tiny African nation of Sao Tome and Principe ended diplomatic ties with Taipei. Any further meeting by US officials, especially Trump, with Tsai would only add further fuel to what is already a looming confrontation between the US and China following Trump’s inauguration on January 20.